How can sleep affect your productivity in your work environment? How do you know in the morning if you had a good sleep last night? Caroline Gordon, our Fit For Industry programme speaker, presents a talk on sleep to the employees at Cross Productions, Niche Magazine. The presentation started off with some interactive questions and answers which revealed some of the employees sleeping habits and problems. Our Fit For Industry programme is presented to companies up and down the country, focusing on the health and well-being in the work place. Employee well-being is increasingly relevant and necessary in the modern work place. Within work-places there are internal issues like time-management, business structure and communication, and external issues such as diet, lifestyle, sleep and hydration. All of which can have an impact on how you, as a staff member, perform every day in your working hours. From a business management perspective well-being plays a major factor in quality, performance and productivity. Many forward-thinking companies now look at addressing these issues and are looking to reduce not only ‘stress’ but putting other strategies in place to make sure that the levels of health and well-being in the workforce are improved, creating what Function Jigsaw call, an Industrial Athlete. Function Jigsaw are at the forefront of helping companies achieve that aim. We have developed a system which covers a multi-disciplinary way of tackling the issues which can be adaptable to different environments and industries. From business management and team work, to health and well-being, a combination of educational talks and massage therapy has been proven to help business’ put the structures in place to maintain positive physical and mental attributes amongst the staff. So far Function Jigsaw have presented a number of talks to the staff at Cross productions with excellent feedback. We have presented talks on stress, healthy eating, sugar, carbohydrates and calories. The employees say that ‘the talks are full of entertaining and surprising facts’. They have given us only positive feedback. “Explanations are always interactive and individual to our environment, Function Jigsaw use their personal stories and experiences to make a fantastic hour of informative facts and team building, and on top, helpful advice and massage therapy for each of us, has us feeling revived and ready to take on the rest of the week” says Jenny Cross, owner of Cross Productions, Niche Magazine. Our recent talk on ‘Sleep’ was based around facts and information on how to get to sleep, how to understand if you have had a good night’s sleep and how different individuals require different sleeping patterns. Caroline spoke about some night time routines that are useful before bed. The do’s and don’ts of how to mentally switch off in the evening to ensure you get to sleep with good quality and what the body does during sleep. Did you know that your body sleeps in a 90-minute cycle, and that sometimes when you wake up in the middle of this cycle, this can explain why you might wake up tired? Did you know that having a light shining from an electrical device or your phone which lights up in your room whilst sleeping has an effect on the skin which in response can affect your sleeping pattern? The audience involved a combination of staff who slept well and didn’t sleep well. Slept for too long or don’t get enough sleep. Everybody has different factors which will affect their sleeping pattern and in return can disturb their feeling and mood the following day at work. “I always look forward to having Function Jigsaw back in the office every month. It’s like having a counsellor, doctor, dietician and fitness expert all rolled into one who really listens and cares about fixing the things that negatively affect your life, which also affect how productive you are at work. It helps that Caroline is so open about her own life. It means we can all relate to her and feel comfortable sharing our own experiences. The massages really help as I sit at a desk all day. 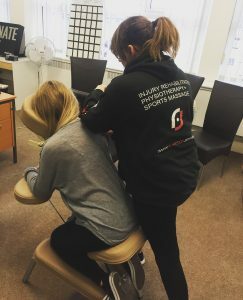 The girls have explained why I get upper back pain and have given lots of advice on how to improve my posture and sitting position.” – Kerry Smith, Senior Journalist and Feature Writer. “I really liked Caroline, she was really interesting to listen to, involved everyone individually and as a group and was very understanding. It was good to hear her own experiences because she was able to give some really good tips on how to help with sleep problems. She could even give advice on my partners sleep problems that affect my own sleep and therefore affect my working life too.” – Leanne Baker, Operations Manager. Massage therapy is one of the key components of our approach and has been known to reduce the psychological markers and the well-being of staff members and can be adaptable to small time frames and environments, and still have a positive effect. This treatment not only gives off a ‘feel-good’ sensation to the staff but can lead to enhanced alertness in the workplace. Definitely the area that most of the staff look forward to the most. “I look forward to the massages. They’ve been really helpful, especially for the problem I had in my arm and helping with the aftermath of having fractured my wrist. They’ve given some good advice, and it’s made a big difference in my day to day life, which in turn has made a difference to how I work.” – Susan Holmes, Design Editor. Massage has not only gone mainstream, it has now gone corporate. Companies large and small have discovered the benefits of wellness in the work place and they are utilising massage as a way to attract and keep employees whilst maintaining productivity. As always, we look forward to presenting the next talk at Cross Productions. ‘Fat’ will be the topic next month. We will be including what fats are classed as good fats? Shocking statistics of daily foods we all crave and intake on a regular basis, and how fat can have an affect how you feel on a daily basis and in work. Read More: The truth behind sleep, sugar and stress. Lower Back Pain? Here are some top injury tips. PreviousPrevious post:New Wattbike Opportunities at Function Jigsaw and PricesNextNext post:Team GB Skier qualifies for the Winter Olympics and finishes 17th on the world stage after an anterior-cruciate ligament rupture January 2016.